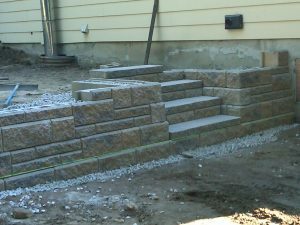 If you are in need of retaining wall services in the Hollis NH area, KDA Construction can provide you with quality service. Retaining walls may just appear to be stacked stone, however they are actually carefully crafted systems with the purpose of restraining soil that could potentially damage your existing landscape or compromise the foundation of your property. The installation of retaining walls requires the expertise of a professional who is familiar with the construction and maintenance of these systems. At KDA we know how to construct stable and reliable retaining walls that look great too. KDA Hardscapes offers a wide variety of styles and colors to choose from. Retaining walls in Hollis NH end up being a stylish complement to your landscape. Many properties in the Hollis New Hampshire area are on a slope, making gardening and landscaping a challenge. The proper installation of retaining walls on a sloped property can provide wonderful garden space and an inviting landscape for all to enjoy. Now that you have decided to install retaining walls on your property, you have many options to choose from. Rock Walls: These walls are typically constructed of basalt or granite and drainage issues always need to be taken into consideration when installing this type of retaining wall. Flagstone and slate are also common rock wall options too. Concrete Block Walls: This type of retaining wall is becoming an increasingly popular option because it comes in numerous sizes, styles and colors. Proper installation is a must, or you can end up damaging your landscape permanently. Brick Walls: Brick retaining walls are a classic choice that can last a lifetime. They tend to be a bit pricey however the beauty and reliability they provide are worth every penny. KDA is responsible professionals so you can count on punctual and courteous service every step of the way. For more information about retaining walls and the services we provide contact us today. We look forward to serving you.